Ah, the silhouette of the pomegranate. Like an apple having a bad hair day. The little burgundy bottle of Trader Joe’s Pomegranate Vinegar has been staring me in the face for weeks now, daring me to buy it. I finally picked it up the other day, and I’ve really been wrestling with what the hell to do with it ever since. 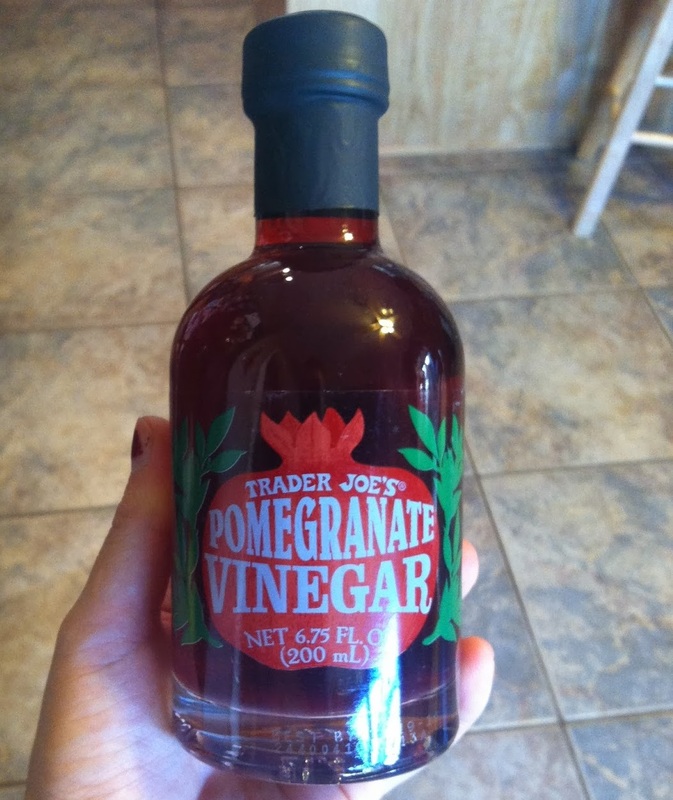 Trader Joe’s Pomegranate Vinegar certainly isn’t the sort of product that you’re reaching for everyday in the kitchen. 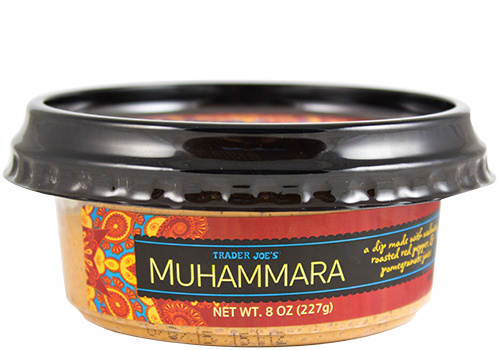 TJ’s seems to focus on two distinct categories of products – standard fare done in the Trader Joe’s style (soup, salad, bacon, etc) and exotic items designed to appeal to the gourmands and foodies of the world. Trader Joe’s Pomegranate Vinegar falls squarely into this second category. Unless you are living a very specialized sort of life, you’re going to find this a difficult product to just casually make use of from day to day. Where I usually run into trouble in my comment section is with these more refined food products (ex: dolmas). As an Average Joe, I don’t have too much trouble wrapping my head around the minestrone soups out there, it’s the niche, world-cuisine stuff, the himalayan tuffle salts if you will, that usually leave me boggled. The advanced culinary spheres are only dimly known to me. I still only have a white belt in kitchen jujitsu. I tend to caramelize my simple syrups while other are already eating their crepes. With that said, I purchased this vinegar knowing full and well that it might best me – but I was determined to give it my best shot. If you haven’t tried this vinegar yet, think of it as tasting like an apple cider vinegar, but with pomegranate instead of apple. A lot of pomegranate. This is a tremendously potent – and flavorful – vinegar, absolutely brimming over with the smells and tastes of pomegranate. The trouble, of course, is that pomegranate is a challenging flavor to incorporate into a meal. I’m mentioned this before, but I think the recent fad of throwing pomegranate flavoring around all over the place is foolhardy. Pomegranate is so tart that it’s just not that good when distilled down to it’s bare essence. Pomegranate seeds are one thing, I’ll gobble them by the handful, but take those seeds, squeeze the juice out of them, and mix it with a strong, acerbic vinegar and you’re talking about a very specific, very difficult flavor to incorporate in your dishes. The vinegar bottle suggests trying it on salad or with chicken. I gave both of these a shot, and in both cases I found that the intense flavor was off-puttingly strong – almost medicinal in taste. But just laying on some lettuce leaves isn’t a pomegranate vinegar’s natural habitat, it was born to grace foods and dishes as exotic as itself. So what is pomegranate vinegar rightly used for? Primarily, it would seem, as a condiment for fancy appetizers, as a dressing on carefully constructed salads or, and this one appealed to me, simmered down into a tangy glaze. In order to do full justice to this product, I felt that I must at least give the glaze a shot. After a little bit of searching I settled on this simple but elegant recipe from Il Fustino, and cooked it up with a dish of fresh grilled chicken breast. The results were exactly what I’d been promised – a fruity, tangy glaze with considerable complexity and none of the acerbic or mediciney hang ups of the straight vinegar. Down right tasty, in other words – all the sweet flavor of pomegranate with just an edge of zing. Was I delighted? Yes. Am I a convert now? No. To be honest, if I’m looking for a tangy, fruity glaze for my chicken, I’ll grab my bottle of Trader Joe’s Balsamic Glaze before I start stewing some up from vinegar. If TJ’s had released a Pomegranate Vinegar Glaze instead of a straight vinegar I might be singing a different song right now, as it is – this is a fine, well made vinegar, it just has an incredible narrow focus of use. Would I Recommend It: Not unless you’re eating a lot of artisnal cheese or like to simmer your own glazes. Would I Buy It Again: One bottle should about do me. Final Synopsis: An intensely strong, pomegranate-infused vinegar perfect for making a glaze and maybe like one other thing.